Your tyres are the only part of your motorcycle, scooter or moped in contact with the road surface so it is essential that they are properly maintained and in a legal and roadworthy state. Failure to comply with the minimum legal standards can result in fines and penalty points, or even worse, your life. 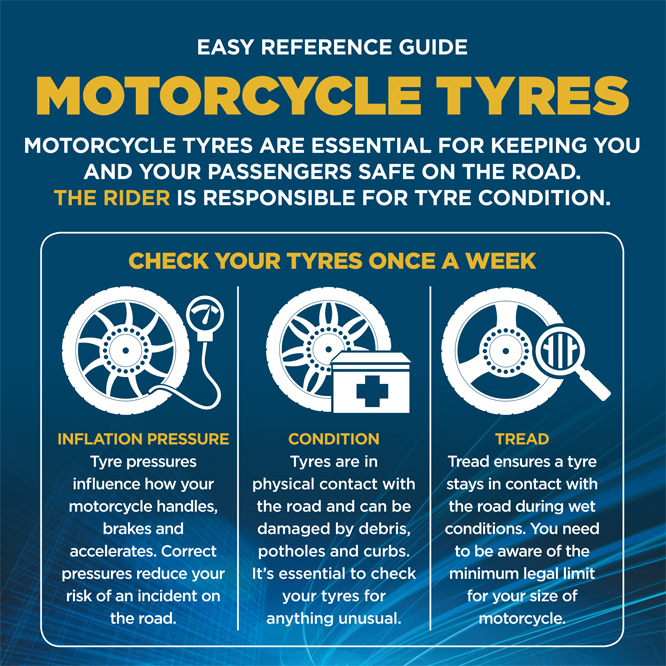 Take a look at TyreSafe’s tips for checking motorcycle tyres. You can view the video of John McGuinness supporting TyreSafe’s Don’t chance it, change it campaign below. Tyres are the only part of your motorcycle in contact with the road surface. Safety in acceleration, braking, steering and cornering all depend on this relatively small area of contact. It is therefore of paramount importance that tyres are properly maintained and in a good condition at all times. With correct care and attention, your tyres will help you achieve the maximum performance, enjoyment and safety from your riding without disruption and with minimal cost.